Huang Yu-Ching, born in Taipei, Taiwan, in 1981, is one of Taiwan’s foremost top tap dancers. 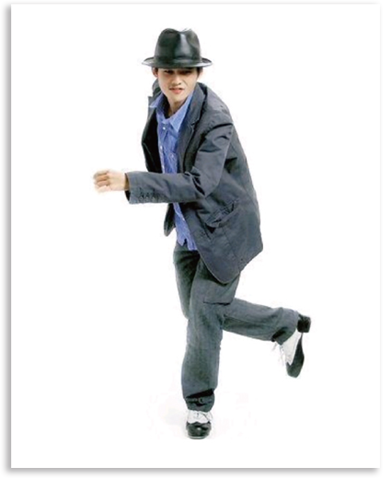 His father, Huang Hua-Xiong, was one of Taiwan’s first tap dancers, giving young Yu-Ching the perfect environment to learn and be immersed in tap dance from an early age. Having learnt different rhythms and styles in the USA and Japan, Huang drew much inspiration from master tap dancer Robert F. Burden Jr. of Philadelphia, and acquired the skills and dance shoes of another Philadelphian dancing legend, the late Lavaughn Robinson. To Huang, tap dance is a belief or a practice. In all modesty, he describes himself as a spiritual practitioner. While dancing, he concentrates on the rhythm of taps and adjusting his body and soul to tune in with the environment, partners and the audience so as to achieve a magical balance with all. He has participated in thousands of performances, TV commercials, as well as theater choreography, and has been invited to teach and perform at tap dance festivals in New York, Philadelphia, Tokyo, Hong Kong, and Taipei. Huang Yu-Ching was formerly, executive director and teacher of Joy (Ai-Yue) Jazz Tap Dance at the National Taiwan College of Performing Arts. He won first place in the group competition at the National Metal Tap Dance Competition, and Most Skilled Dancer at the Kaohsiung Tap Dance Competition. Huang also starred in Hello There, Mr. LaVaughn at the 2017 Taipei Fringe Festival.